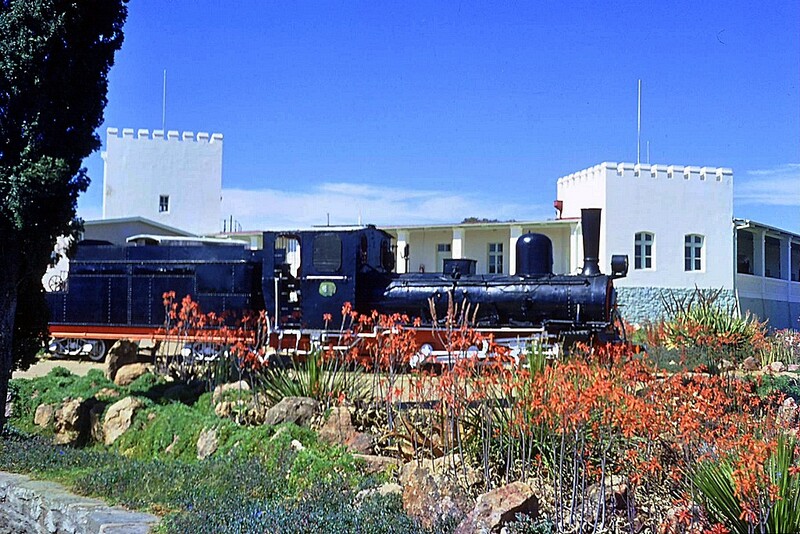 July 1972 - Locomotive in the garden at the Alte Feste in Windhoek - this photo courtesy of Mike Wattrus. These pictures were taken before sunrise one morning in 1972. Location - near the "Alte Feste" Museum in Windhoek. 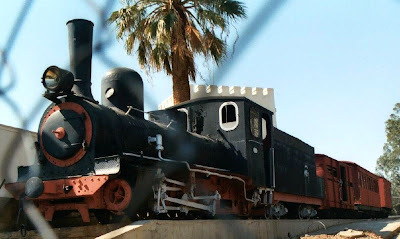 At that time this train was displayed in a public area, but it has since been moved to be inside the museum boundaries in the interest of preserving the train from vandalism. 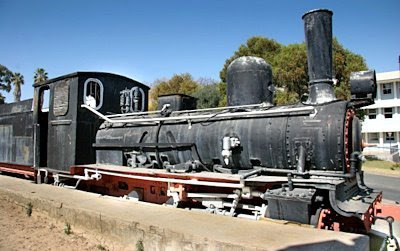 OMEG #56 on the Otavi line, Henschel works number 7625 built in 1906. 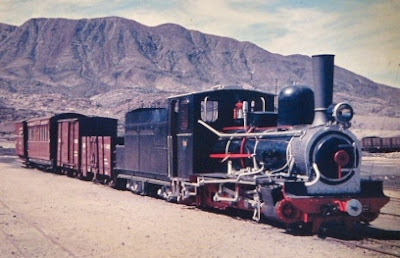 The Otavi line initially belonged to O.M.E.G - the Otavi Minen- und Eisenbahn-Gesellschaft and was constructed by the firm Arthur Koppel & Co from Berlin, Germany. The locomotive is from the class Hb 0-6-2T. Of the 15 locomotives built by Henschel for the Otavi line between 1905 and 1908, six were absorbed into the SAR. 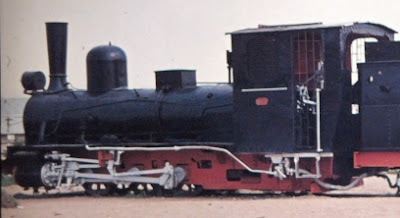 The engines had Allan valve gear and often ran with an auxiliary tender attached (see photo above), which contained both coal and water. The train was nicely displayed in a bit of a cutting! 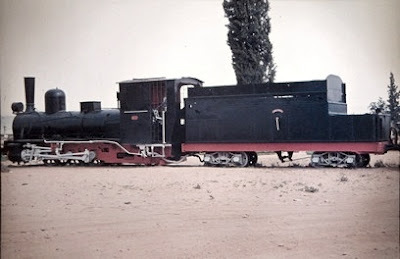 Way back in 1960 my father Hennie Conradie photographed this same narrow gauge locomotive in Usakos alongside a standard Cape gauge diesel electric locomotive. Also my father's picture taken in 1960 in Usakos. 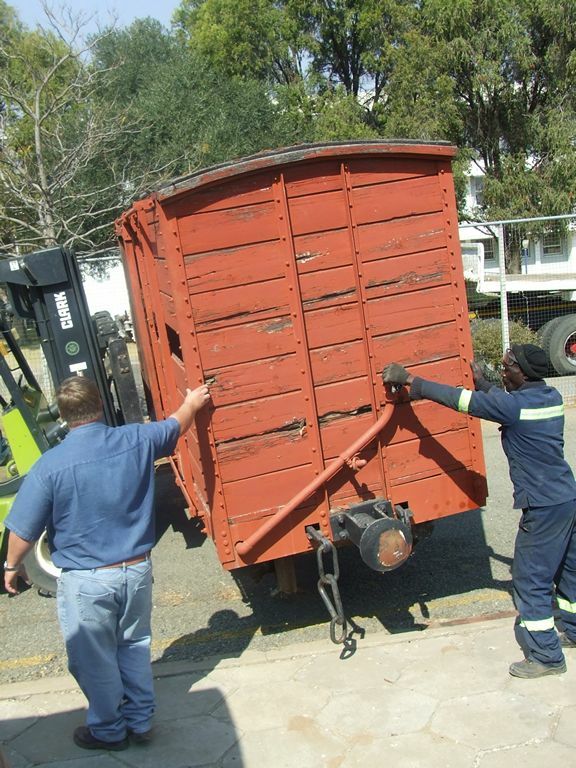 The restored narrow gauge train all ready to be transported to the museum in Windhoek. 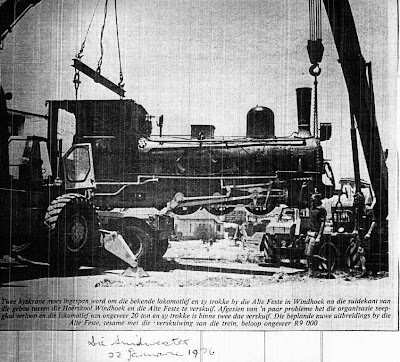 On 28th Aug 1964, the Windhoek newspaper "Die Suidwes-Afrikaner", reported a small mishap, when the locomotive was unloaded at it first plinth, near the Alte Feste, as shown in the first series of pictures above. 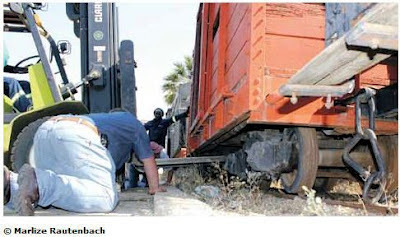 Fortunately the sandy earth halted the loco from going down hill all the way into the streets of Windhoek. This scan kindly provided by Konrad Schüllenbach. 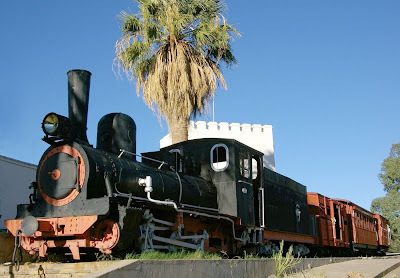 The locomotive and train behind it, were displayed here for some 12 years, and then in January 1976, the historical display was moved to its current location next to the Alte Feste building. Photo in the Windhoek newspaper "Die Suidwester" dated 22 January 1976. This scan kindly provided by Konrad Schüllenbach. Subsequently the Windhoek newspaper "Algemeine Zeitung" had this picture of the locomotive on its new plinth. This scan kindly provided by Konrad Schüllenbach. 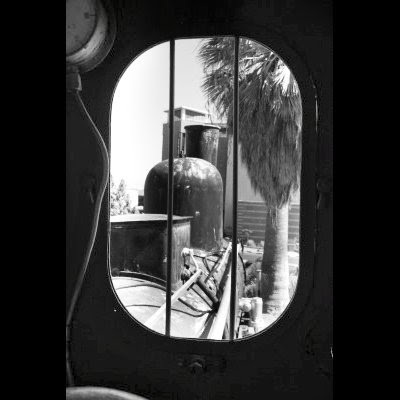 Later the train was moved to a position on the inside of the museum fence. 20 Dec 2005 - photo posted to Panaramio by unknown photographer. On 5 Aug 2008 Duncan Burnett and his family visited the Alte Feste Museum and took these photos. You can read more about his visit here. 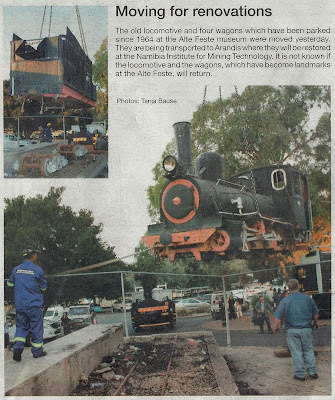 Unfortunately in 2009 someone informed me: "I am afraid the train carriages outside the Alte Feste in Windhoek are in a poor state of repair. Indeed one carriage has been burnt, possibly by arsonists. The engine could also benefit from a little restoration." 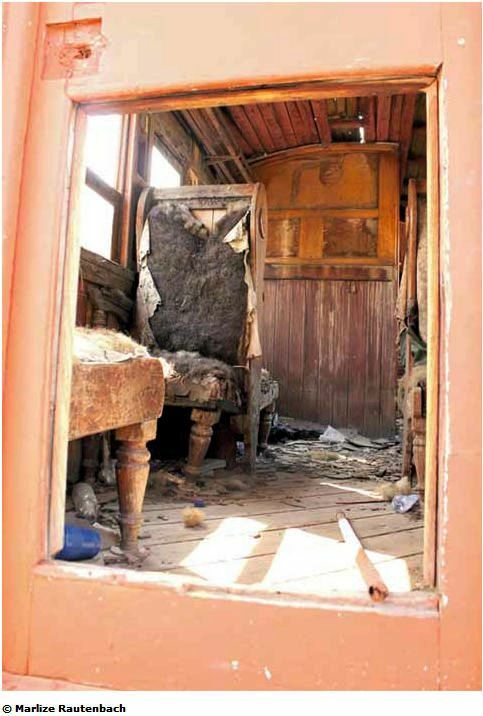 This is the shocking state of the conductor's car. At present it is unknown when it was turned into this condition. Most probably street people slept in the van, and caused the unfortunate fire. 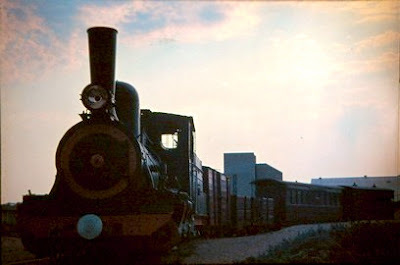 Compare with the once proud little train as pictured in 1960 in the Usakos rail yard! 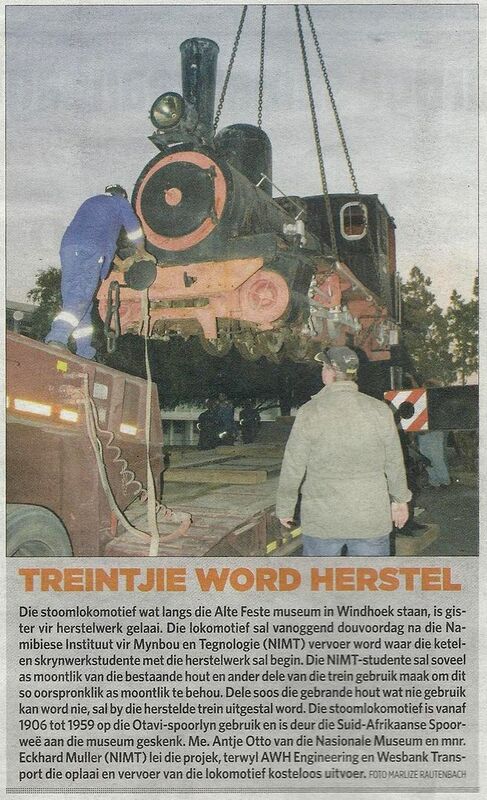 At the end of July 2012, Konrad Schullenbach, Curator of the Transnamib museum in Windhoek, kindly informed me of the exciting new phase in the history of little train at the Alte Feste. 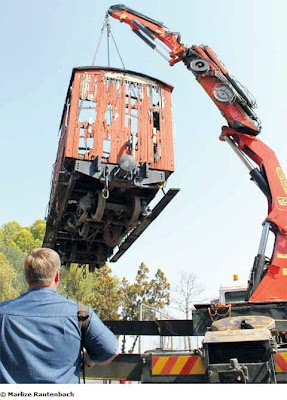 On July 30, the train was loaded on low bed trailers and transported to Arandis, where students of the Namibian Institute of Mining and Technology (NIMT), a technical institute focusing on training skilled industrial workers, will restore the train to as close as possible to the original appearance. The restoration work is expected to take about a year to complete. 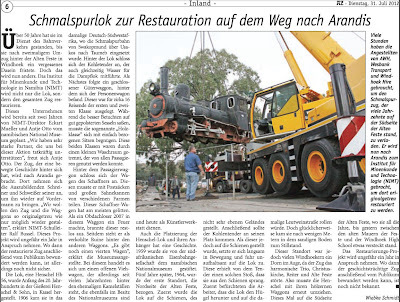 It is not yet known where the train will be put next for public display. On 31 July, all the newspapers in Windhoek took notice of this event, illustrated with photos. 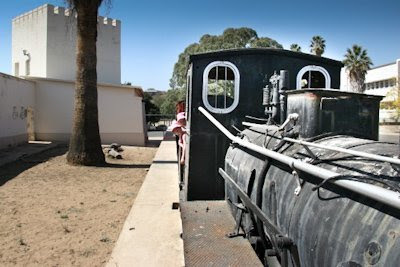 A TWO-YEAR project to restore the train that has been a historical landmark at the Alte Feste in Windhoek was set into motion this week when it was moved to the Namibia Institute of Mining Technology (NIMT) outside Arandis. Eckhard Mueller from NIMT and Antje Otto from the National Museum in Windhoek have been working together for the past two years on a plan to move and restore the train. With the help of Wesbank Transport and AWH Engineering, Rigging and Rentals, this became a reality on Monday. The locomotive, is a Henschel Hb 56, weighs close to 20 tons. The locomotive and its wagons were in use between Usakos and Tsumeb between 1906 and 1959. 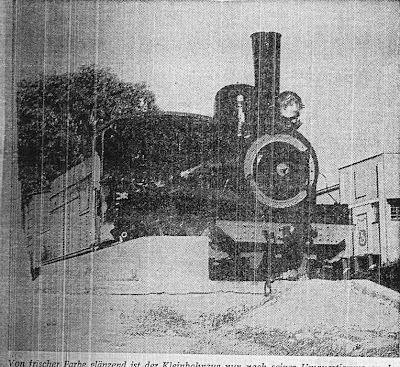 The South African Railways then donated it to the museum and in 1964 it was placed in front of the Alte Feste, but it was too close to the Reiterdenkmal and was moved in 1974 to the southern side. 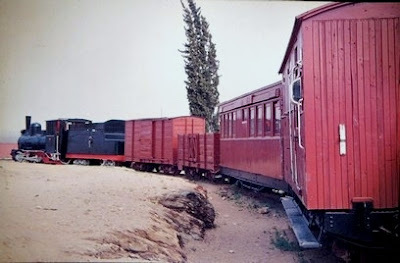 The train consists of the locomotive, a coal wagon, a closed goods wagon, a passenger coach for first and second class and a wagon in which the conductor travelled with the postbags, milk and cream cans that were picked up along the route. The passenger coach could transport 16 passengers. The first-class passengers could sit on upholstered seats while the second-class passengers sat on plain wooden benches. The two classes were divided by a small washroom. The conductor’s wagon was destroyed in 2007 when it was set alight by a homeless person who slept in the train and made a fire. Another open goods wagon in which livestock were transported is still parked at the old Camel Stables in Windhoek. 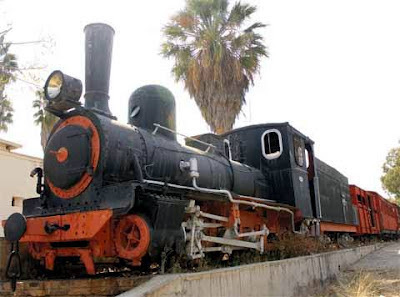 The boilermaker and carpentry students at NIMT will renovate the train. "We will keep all the original components of the train, even if they are rusted or burnt, and they will be placed with the renovated train as they are part of its history," said Ralf Bussel, the principal of the engineering department at NIMT. The renovations will take about a year. 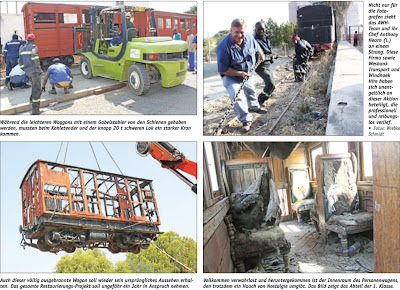 It is not clear yet whether the train will be returned to the Alte Feste after its facelift. Die stoomlokomotief wat langs die Alte Feste museum in Windhoek staan, is gister (30 Julie 2012) vir herstelwerk gelaai. Die lokomotief sal vanoggend douvoordag na die Namibiese Instituut vir Mynbou en Tegnologie (NIMT) vervoer word waar die ketel- en skrynwerkstudente met die herstelwerk sal begin. 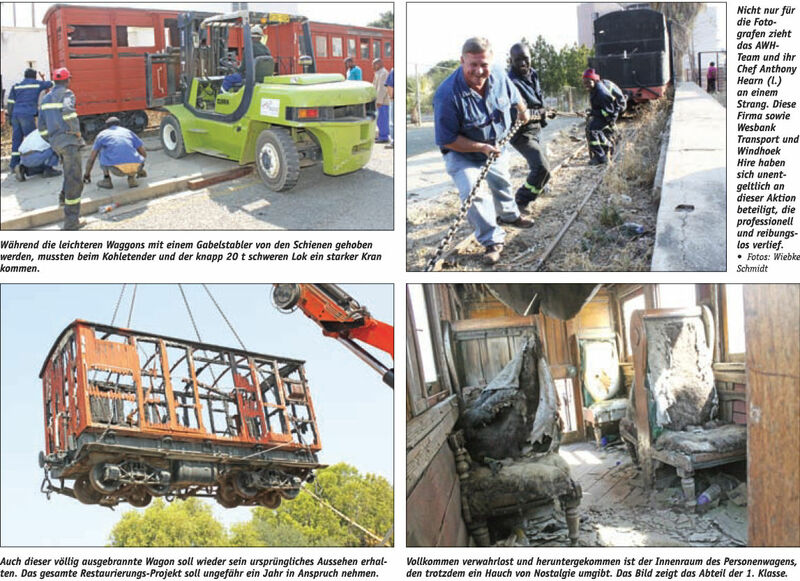 Die NIMT-studente sal soveel as moontlik van die bestaande hout en ander dele van die trein gebruik maak om dit so oorspronklik as moontlik te behou. 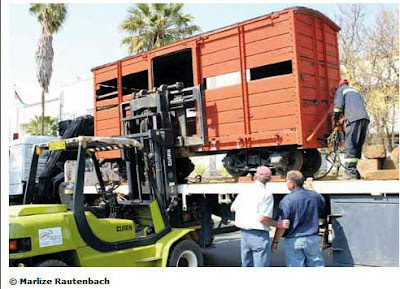 Dele soos die gebrande hout wat nie gebruik kan word nie, sal by die herstelde trein uitgestal word. 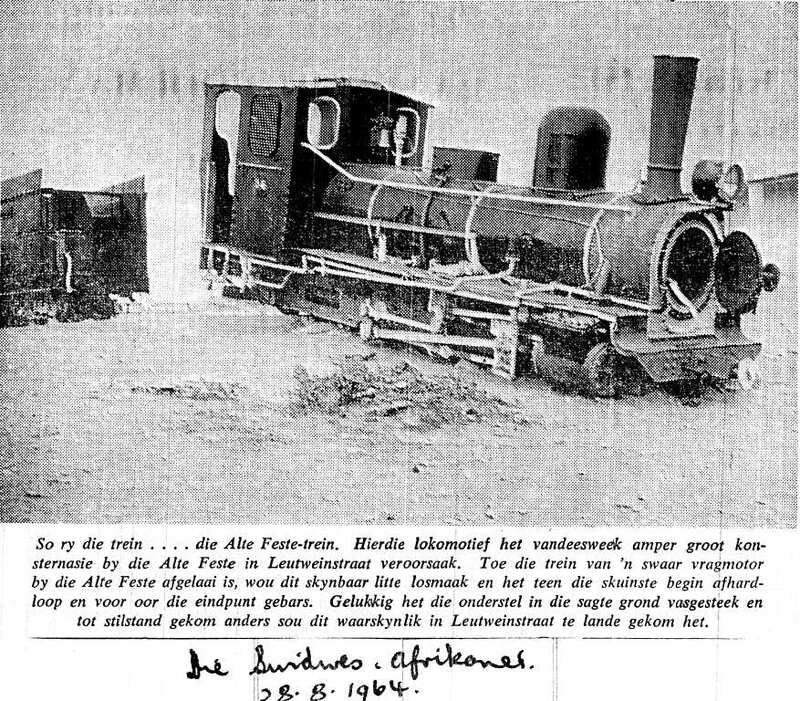 Die stoomlokomotief is vanaf 1906 tot 1959 op die Otavi-spoorlyn gebruik en is deur die Suid-Afrikaanse Spoorweë aan die museum geskenk. Me. Antje Otto van die Nasionale Museum en mnr. Eckhard Muller (NIMT) lei die projek, terwyl AWH Engineering en Wesbank Transport die oplaai en vervoer van die lokomotief kosteloos uitvoer. REPUBLIKEIN se fotograaf, Marlize Rautenbach, was op die toneel om dié “reddingsoperasie” te dokumenteer. Algemeine Zeiting web page or pdf document. Baie dankie vir 'n interessante stukkie geskiedenis.